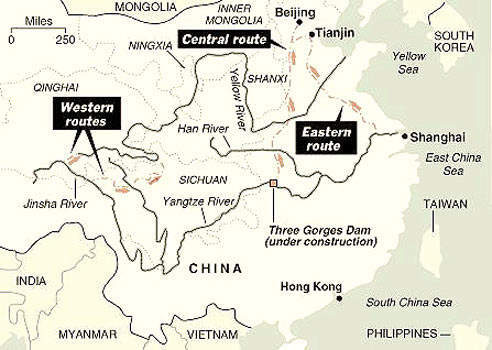 A map of China's South-to-North Water Diversion mega-project. The Haihe River and Grand Canal. The project will eventually link the Haihe with the country's three other major rivers – the Yangtze, Yellow and Huaihe. 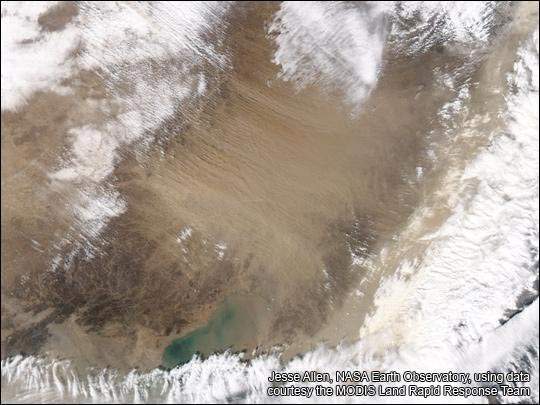 Satellite image of the Yangtze River and the Yellow River. Once the project is completed, up to 44.8 billion cubic metres of water will be diverted through three canals to the north. 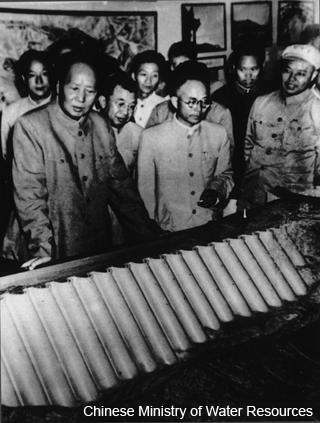 The late chairman Mao Zedong on a visit to the Huaihe River Commission Hefei reservoir model in 1954. Work began on the project nearly fifty years after Mao had first proposed the idea. The Three Gorges Dam and Reservoir. Declining water reserves in the Danjiangkou Reservoir in Hubei Province have led to the suggestion that this might have to be used as an additional source for the project. Beijing skyline; the main aim of the project is to ease the water shortage in northern China, particularly around Beijing. The South-to-North Water Diversion Project in China is the largest of its kind ever undertaken. The project involves drawing water from southern rivers and supplying it to the dry north. This massive scheme has already taken 50 years from conception to commencement and is expected to take almost as long to construct. Planned for completion in 2050, it will eventually divert 44.8 billion cubic metres of water annually to the population centres of the drier north. When finished, the work will link China’s four main rivers – the Yangtze, Yellow River, Huaihe and Haihe – and requires the construction of three diversion routes, stretching south-to-north across the eastern, central and western parts of the country. The complete project is expected to cost $62bn – more than twice as much as the country’s controversial Three Gorges Dam. Northern China has long been a centre of population, industry and agriculture and with all three growing apace, the per capita share of the region’s limited water resources has inevitably kept falling. Historically this has led to the over-exploitation of groundwater – often supplying urban and industrial development at the expense of agriculture – leading to severe water shortages in rural areas. In addition, land subsidence and the region’s frequent sandstorms have also been linked to the excessive use of groundwater. The late chairman Mao Zedong first proposed the idea of the diversion project in 1952, intending the ambitious scheme to ease the growing water shortages in the cities of Beijing and Tianjin and the northern provinces of Hebei, Henan and Shandong. On 23rd August 2002 – 50 years later – after extensive research, planning and discussion, the project was approved by the State Council and work began on the eastern route of the project in December, construction commencing on the central route a year later. A special limited-liability company has been created to cover the construction, operation and maintenance of the main project, with each province being required to set up a water supply company to manage the local administration and infrastructure elements. The eastern route was expected to supply Shandong Province and the northern part of Jiangsu during 2007 – a year ahead of the original schedule – linking Shandong with the Yangtze River and bringing water north to the Huang-Huai-Hai Plain via the Beijing-Hangzhou Grand Canal, but was delayed. Diverted from a major branch of Yangtze River, near Yangzhou city, the water will travel along existing river channels to the Weishan mountains of Shandong, before crossing the Yellow River via a tunnel and flowing to Tianjin. The finished diversion will be slightly over 1,155km long and involves the construction of 23 pumping stations with the installed capacity of 453.7MW in the first stage alone to complement the seven existing ones, which will themselves be rehabilitated and upgraded. This part of the project will also include nearly 9km of tunnels, from the outlet of Dongping Lake to the inlet of the Weilin Canal, including a 634m long siphon section, together with two 9.3m diameter horizontal tunnels 70m under the Huanghe riverbed. Several key projects of the eastern route have been completed. However, the work on the route was delayed due to farm and industrial pollution that endangers the quality of water. It is expected to be completed by 2013. 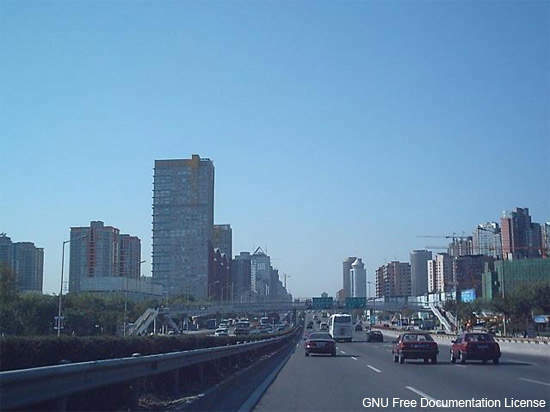 Construction of the central route began in December 2003. It was planned to be finished before the commencement of Beijing Olympic Games in August 2008 to provide Beijing with drinking water. However, by September 2008, only 307km of the central route had been completed. The central route diverts water from the Danjiangkou reservoir on the Han River via new canals near the west edge of the Huanghuaihai Plain to flow through Henan and Hebei Provinces to Beijing – a diversion route totalling some 1,267km in length. The nearby city of Tianjin will also draw water from the trunk line near Xushui in Hebei Province. Initially designed to transfer 9.5 billion cubic meters of water, by 2030 some 13–14 billion cubic metres will be flowing along this system. The work also includes the construction of two tunnels of 8.5m internal diameter some 7km long, with a flow design of 500m³/s. Declining reserves in the Danjiangkou Reservoir have led to the suggestion of drawing water from the Three Gorges Reservoir to bolster the supply and meet the demands of this part of the project. 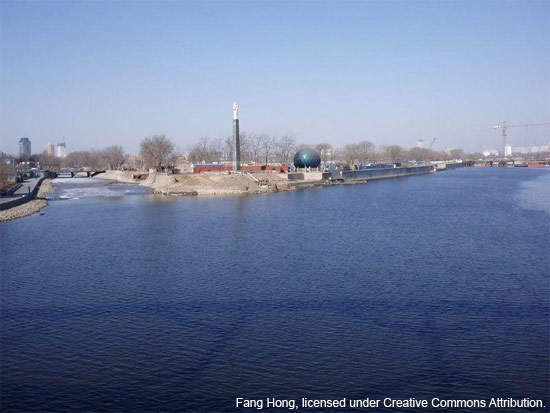 The water from Han River is yet to come through the completed canal, however water in the canal flows from various Hebei Province reservoirs. The central route project was scheduled for completion by 2010 but has been postponed to 2014 due to environmental concerns and for the expansion of the Danjiangkou reservoir in the route. Construction of the western route – which involves working on the Qinghai-Tibet Plateau – between 3,000m–5,000m above sea level – is scheduled to begin in 2010 and will involve overcoming some major engineering and climatic challenges. Once completed in 2050, the project will bring 4 billion cubic metres of water from three tributaries of the Yangtze – the Tongtian, Yalong and Dadu rivers – nearly 500km across the Bayankala Mountains and then on to northwest China. At a symposium in Beijing in 2006 officials from the Yellow River Water Resources Committee called for preparatory steps to be taken swiftly to hasten the construction of this route of the project. It has been predicted that an additional 4.5 billion cubic metres of water will be required by 2030 to maintain economic growth in the region with its booming population and major construction and development projects. Construction costs of the eastern and central routes is estimated to be 254.6bn yuan ($37.44bn). 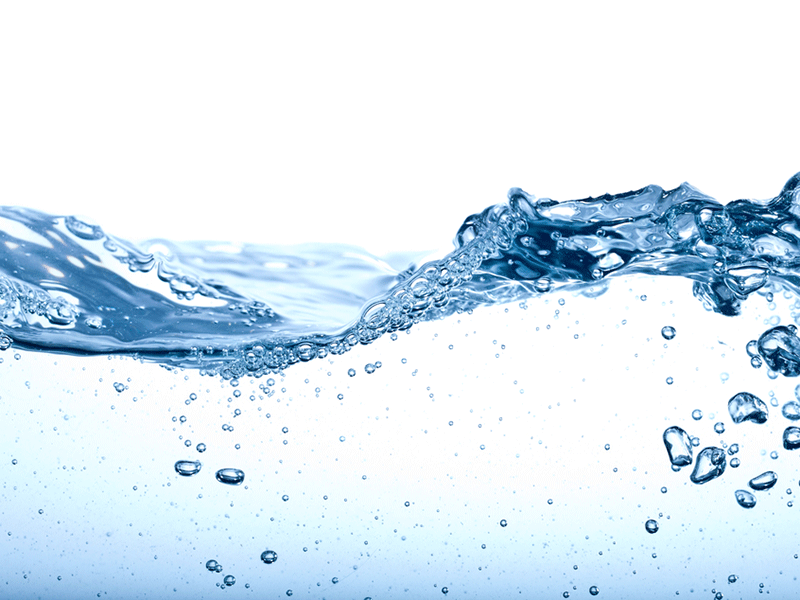 China has reserved 53.87bn yuan ($7.9bn) for the south-to-north water diversion project. Of the 53.87bn yuan, the central government has budgeted 15.42bn, special funds in treasury bonds from central government accounts for 10.65bn yuan, and local governments are funding 7.99bn yuan. Loans will contribute 19.81bn yuan for the project. The construction costs of the project have drastically changed due to hikes in commodity prices, changes in the national policy and investment structures of the project. Around 30.48bn yuan of the earmarked amount has been spent for the construction of eastern (5.66bn yuan) and central routes (24.82bn yuan). 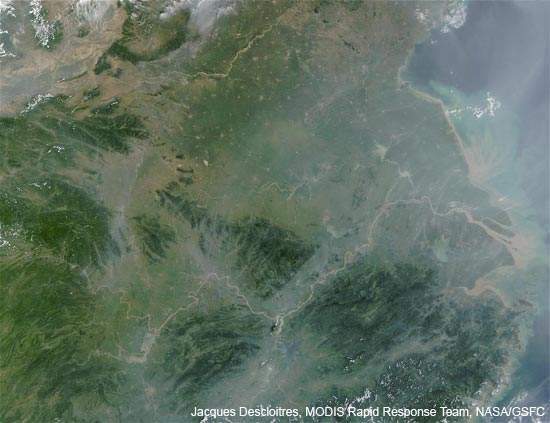 Like China’s other mega-project – the Three Gorges Dam – the diversion scheme has provoked many environmental concerns, principally regarding the loss of antiquities, the displacement of people and the destruction of pasture land. In addition, plans for further industrialisation along the routes of the project pose a serious risk of pollution to the diverted water. To help counter this threat, the Chinese Government has earmarked just over $80m for Jiangdu, Huai’an, Suqian and Xuzhou, in the east of Jiangsu Province to build treatment facilities – though estimates suggest that the actual cost is more than double this figure. Overall, around 260 projects have been instigated to reduce pollution and help ensure that water in the areas of the diversion project will meet minimum drinking standards. The South-to-North Water Transfer Project Company is the project owner, with pre-project construction work being done by Hanjiang Water Resources and Hydropower. Project management is being performed by the State Development and Planning Commission, the Ministry of Water Resources, the Ministry of Construction, the State Environment Protection Administration and China International Engineering Consultant Corporation. GCW Consulting are providing infrastructure development plans. Haihe Water Resources Commission and Tianjin Hydroelectric Investigation and Design Institute are responsible for the design and planning for the Eastern Route; Changjiang Water Resources Commission for the Middle Route and the Yellow River Conservancy Commission for the Western Route. Construction is being done by Hanjiang Water Resources and Hydropower on the Eastern Route and Danjiangkou Water Resources and Hydroelectric are building the Middle Route. In addition, many of the country’s ministries, organisations and institutes were also involved during the 50-year period of extensive planning and research to turn Mao’s initial concept into the current scheme of work.